Rotisserie cooking is a form of roasting and roasting something simply means putting it in the oven uncovered or on a grill with the lid down. 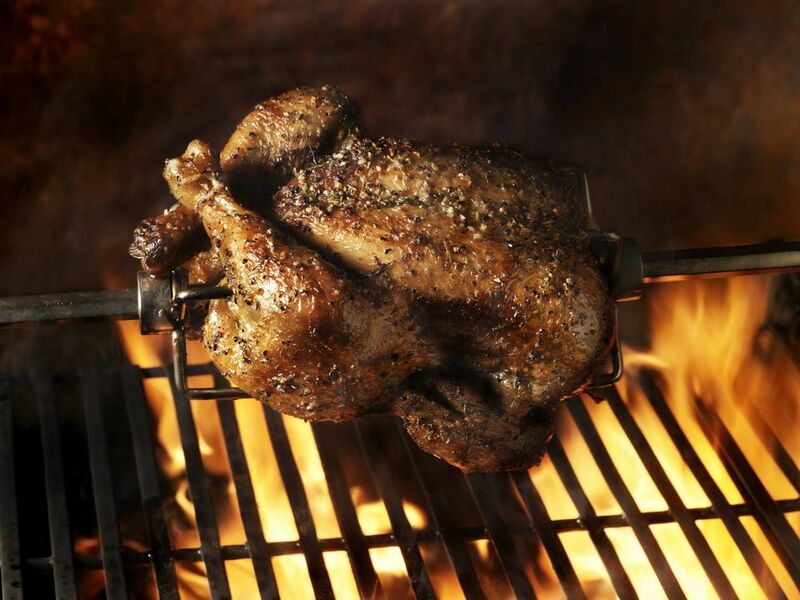 Roasted chicken turns into rotisserie chicken when it is skewered on a spit and rotated over an open fire for more even cooking. 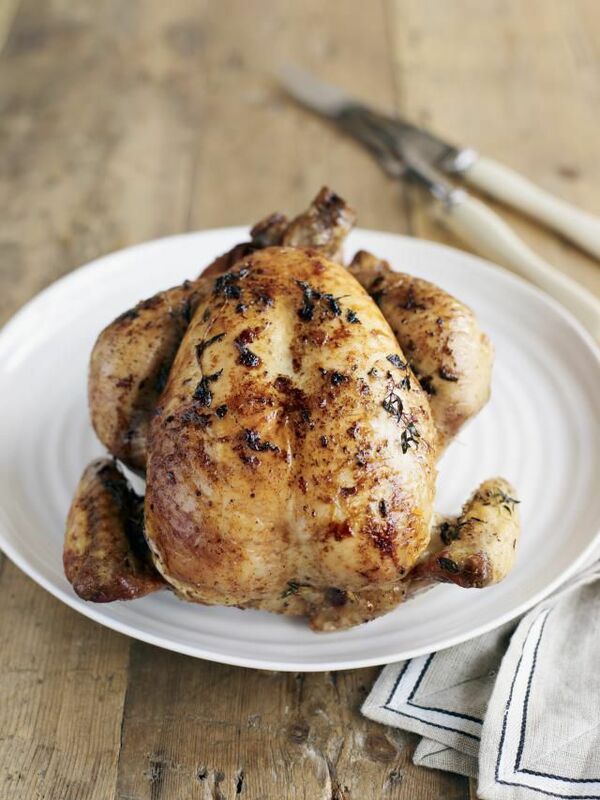 Rotisserie chicken is not only a popular fast food from your local deli counter, but it is also a great way to cook chicken. Two things not commonly known about rotisserie chicken is that it is best fresh and delicious 10 minutes off the grill, not spending hours under a warming lamp. Also, preparing a rotisserie chicken is quite simple. With a grill (charcoal or gas), a rotisserie kit, and a chicken, we can achieve a much tastier meal at home than available at most grocery stores. Next comes the preparation of the chicken. Remove the contents from the inside and cut off any loose skin. To increase tenderness and moisture, we suggest that you brine the chicken, but this step isn't mandatory. It is also helpful to truss the chicken to hold it together better on the rotisserie. To begin, set up the rotisserie kit on the grill. This is a pretty easy operation that requires 10 minutes and a screwdriver. Of course, different grills and rotisserie kits have different arrangements, so read the instructions. The first problem with putting a chicken on the rotisserie is that a chicken is basically hollow. This doesn't give the rotisserie rod much to hold onto. This means that the chicken can move around as it spins. As it moves, it will most likely come loose. The rotisserie forks are there to hold onto the bird, but we find that placing something in the cavity of the chicken helps to secure it. We use a lemon for this purpose. Just thread the lemon onto the rotisserie rod where the chicken will be. Make sure that you have one fork on the rod, on the handle side. Place it pointing towards the middle on the handle end of the rod. The lemon will fill up the cavity of the chicken and help hold it in place. As the chicken cooks, it will shrink a little giving it a better hold. If you don't like the lemon flavor on your chicken, you can use something else. Try an apple, onion, or even a potato. The potato will be harder to get onto the rod, but the neutral flavor won't affect the taste of the chicken as much (if that is what you are after). Just try to pick something that will fill the cavity sufficiently. It is important that you get the chicken secured to the rotisserie rod as well as possible. This is the most challenging step in the process, but if you do it right, you won't have any more trouble with it. Since a chicken has many parts that are loose, you need to secure not just the bird, but the legs and the wings. For this reason, you might want to truss the chicken, but you don't need to if you can get everything loaded in the right place. It is easier to place the chicken on a platter or cutting board then run the rod (with the lemon) through the bottom of the chicken and out through the neck. This puts the lemon safely inside. Put the second fork on the rod, pointing toward the chicken and bring it through. It might seem like you don't have enough hands for this operation but be patient. You need to make sure that the whole chicken is tight in the forks before proceeding. Press the forks together, gathering up the legs and wings in the forks so that they are held in place. If you have a dangling wing it will flop around and likely burn. Once you have the bird secured, tighten the screws on the fork. We suggest you roll it around a little to make sure that the legs and wings hold. Don't worry about the balance, we'll get to that in a minute. If you look at the picture, you will see that we have pulled the wings through the forks so they can't move. This is how you want to position the chicken. Balancing the chicken on the rotisserie makes sure it cooks evenly and doesn't burn out the rotisserie motor. If the rotisserie kit has a counterbalance, then there should be no trouble getting it balanced. If not, there isn't too much you can do about it. Chickens are heavier on the back side than on the breast side. To balance the chicken, remove the motor from the bracket and place the rotisserie rod with the chicken on the grill so that it moves freely. The heavy side will drop toward the bottom. Pull the counterbalance straight up and tighten. It won't balance perfectly, but you will offset the weight enough to allow the motor to handle the load easily. Now attach the motor and turn it on. Make sure that the chicken doesn't move on the rod and that it turns easily. Once you have determined that it will stay put, you can start the grill. Rotisserie chicken is grilled indirectly. This means that the burners directly underneath the chicken are off and that all the heat is being provided by the other burners. If the burners under the chicken are on, you will get flare-ups. Adjust the heat on your grill until the temperature reaches around 350 F. It is not a good idea to wander away too long. It is best to keep an eye on the chicken for the first few minutes to make sure that everything is going right. You have probably noticed that we haven't done much to flavor the chicken. Now is the time to start adding flavor and we will do this by basting the outside of the bird. We like chicken, so we tend to keep the seasoning simple, which enhances the bird without overpowering it. You can add whatever you like, but we are going to stick with the lemon and a little rosemary. Break up the rosemary leaves a little with a rolling pin to get the oils out. Add them to the olive oil and lemon juice. The acid in the lemon juice is going to bring out the rosemary flavor and blend it with the olive oil. Start basting the chicken after about 20 minutes on the rotisserie. Continue basting every 20 minutes until the chicken is nearly done. At a cooking temperature between 300 F and 350 F, it takes a chicken about 20 to 30 minutes per pound to cook. A 4-pound chicken should take nearly 2 hours. When the internal temperature of the chicken reaches 175 F 180 F, it is time to take it off the heat. As the chicken cooks, you might notice that it tends to plump up. As the chicken gets close to being done, this plumping goes away. Also, the skin of the chicken will be a dark, golden brown. These are clues that it is nearly done and time to start checking the temperature. To test the internal temperature, use a meat thermometer and take a reading in at least two different places. Test the center of the chicken breast and in the thigh right above the drumstick. These are the densest parts of the chicken and the slowest to cook. When both of these places read above 175 F, it is time to take the chicken off the grill. Once the rotisserie chicken has reached the right temperature, it is time to get it off the grill. Have a hot pad or fireproof glove and a platter or cutting board ready beside the grill. Remember that the metal rod of the rotisserie is going to be about 300 F when you grab it. It is easy to burn yourself so be careful. When taking the rotisserie rod and chicken off the grill, start by turning off the burners and rotisserie motor. We find it is usually easier to lift up and pull off the motor first to get it out of the way. Get a good hold of the rod on both ends and place the chicken on your platter and cutting board. We've seen many a bird fall to the ground so keep a good hold of it. Using your hot pad or glove, loosen the screw on the fork opposite from the handle and slide it off. Now the chicken is free to move. Holding the chicken on the platter or cutting board, slowly pull the rod from the chicken. The lemon we put inside will stay with the chicken and you can remove it before carving. Let the chicken rest for 5 minutes allowing the juices flow back into the meat. Once this time is up, carve the chicken as normal. If you have not placed a pan beneath the chicken while cooking, the drippings have fallen into your grill without burning off. It is a good idea to light up the middle burner and get it burned off or next time you use your grill, this might cause a pretty big flare-up.